THE MEGARA and THE DEAD ADONIS are two anonymous Greek poems of the Hellenistic era, perhaps composed in the C3rd or C2nd B.C. The Megara is a Greek bucolic poem in the style of Theocritus, and sometimes attributed to that poet. The Dead Adonis is a Greek lyric poem belonging to the Anacreontea school. This Loeb volume is still in print and available new from Amazon.com (click on image right for details). 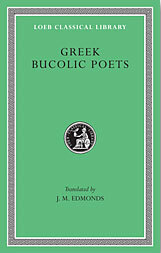 In addition to these two short poems, the book contains the Idylls of Theocritus, the poems of Bion and Moschus, various pattern-poems (by Simas, Theocritus, Dosiadas, and Vestinus), as well as source Greek texts, Edmond's introduction and footnotes and an index of proper names. This poem gives a picture of Heracles’ wife and mother at home in his house at Tiryns while he is abroad about his Labours. The two women sit weeping. The wife bewails his mad murder of their children, and gently hints that the mother might give her more sympathy in her sorrow if she would not be for ever lamenting her own. To which the kind old Alcmena replies, “sufficient unto the day is the evil thereof”; but through her own anxiety for the safety of the labouring Heracles, increased now by an evil dream, is food enough, God knows, for lamentation, she feels, as indeed Megara must know full well, for her sorrowing daughter too. The poem bears a resemblance to Theocritus XXV, and is thought by some to belong to the same author. Megara the wife of Heracles addresses his mother Alcmena. “Mother dear, O why is they heart cast down in this exceeding sorrow, and the rose o’ they cheek a-withering away? What is it, sweet, hath made thee so sad? Is it because thy doughty son be given troubles innumerable by a man of nought, as a lion might be given by a fawn? O well-a-day that the Gods should have sent me this dishonour! and alas that I should have been begotten unto such an evil lot! Woe’s me that I that was bedded with a man above reproach, I that esteemed him as the light of my eyes and do render him heart’s worship and honour to this day, should have lived to see him of all the world most miserable and best acquaint with the taste of woe! O misery that the bow and arrows given him of the great Apollo should prove to be the dire shafts of a Death-Spirit (Ker) or a Fury, so that he should run stark mad in his own home and slay his own children withal, should reave them of dear life and fill the house with murder and blood. Aye, with my own miserable eyes I saw my children smitten of the hand of their father, and that hath no other so much as dreamt of. And for all they cried and cried upon their mother I could not help them, so present and invincible was their evil hap. But even as a bird that waileth upon her young ones’ perishing when her babes be devoured one by one of a dire serpent in the thicket, and flies to and fro, the poor raving mother, screaming above her children, and cannot go near to aid them for her own great terror of that remorseless monster; even so this unhappiest of mothers that’s before thee did speed back and forth through all that house in a frenzy, crying woe upon her pretty brood. O would to thee kind Artemis, great Queen of us poor women, would I too had fallen with a poisoned arrow in my heart and so died also! Then had my parents taken and wept over us together, and laid us with several rites on one funeral pile, and so gathered all those ashes in one golden urn and buried them in the land of our birth. But alas! they dwell in the Theban country of steeds and do till the deep loam of the Aonian lowlands, while I be in the ancient Tirynthian hold of Hera, and my heart cast down with manifold pain ever and unceasingly, and never a moment’s respite from tears. “My poor girl,” says she, “what is come over thy prudent heart? How is it thou wilt be disquieting us both with this talk of sorrows unforgettable? Thou hast bewept them so many times before; are not the misfortunes which possess us1 enough each day as they come? Sure he that should fall a-counting in the midst of miseries like ours would be a very fond lover of lamentation. Be of good cheer; Heaven hath not fashioned us of much stuff as that. And what is more, I need no telling, dear child, of thy sadness; for I can see thee before me labouring of unabating woes, and God wot I know what ‘tis to be sore vexed when the very joys of life are loathsome, and I am exceeding sad and sorry thou shouldest have part in the baneful fortune that hangs us so heavy overhead. For before the Maid I swear it, and before the robed Demeter – and any that willingly and of ill intent foresweareth these will rue it sore – I love thee no whit less than I had loved thee wert thou come of my womb and wert thou the dear only daughter of my house. And of this methinks thou thyself cannot be ignorant altogether. Wherefore never say thou, sweetheart, that I heed thee not, albeit I should weep faster than the fair-tressed Niobè herself. For even such laments as hers are no shame to be made of a mother for the ill hap of a child; why, I ailed for nine months big with him or ever I so much as beheld him, and he brought me nigh unto the Porter of the Gate o’ Death, so ill-bested was I in the birthpangs of him; and now he is gone away unto a new labour, alone into a foreign land, nor can I tell, more’s the woe, whether he will be given me again or nor. And what is more, there is come to disquiet my sweet slumber a direful dream, and the adverse vision makes me exceedingly afraid lest ever it works something untoward upon my children. There appeared unto me, a trusty mattock, even as one hired to labour, he was digging of a ditch along the edge of a springing field, and was without either cloak or belted jerkin. And when his labouring of the strong fence of that place of vines was got all to its end, then would he stick his spade upon the pile of the earth he had digged and put on those clothed he wore before; but lo! there outshined above the deep trench a fire inextinguishable, and there rolled about him a marvelous great flame. At this he went quickly backward, and so ran with intent to escape the baleful might of the God o’ Fire, with his mattock ever held before his body like a buckler and his eyes turned now this way and now that, lest the consuming fire should set him alight. Then methought the noble Iphicles, willing to aid him, slipped or ever he came at him, and fell to the earth, nor could not rise up again; nay, but lay there helpless like some poor weak old man who constrained of joyless age to fall, lieth on the ground and needs must lie, till a passenger, for the sake of the more honour of his hoary beard, take him by the hand and raise him up. So then lay targeteer Iphicles along; and as for me, I wept to behold the parlous plight of my children, till sleep the delectable was gone from my eyes, and lo! there comes me the lightsome dawn. This piece of Anacreontean verse is shown both by style and metre to be of late date, and was probably incorporated in the Bucolic Collection only because of its connexion in subject with the Lament for Adonis. When the Cytherean saw Adonis dead, his hair dishevelled and his cheeks wan and place, she bade the Loves go fetch her the boar, and they forthwith flew away and scoured the woods till they found the sullen boar. Then they shacked him both before and behind, and one did put a noose about the prisoner’s neck and so drag him, and another belaboured him with his bow and so did drive, and the craven beast went along in abject dread of the Cytherean. Then upspake Aphrodite saying, “Vilest of all beasts, can it be thou that didst despite to this fair thigh, and thou that didst strike my husband?” To which the beast “I swear to thee, Cytherean,” answered he, “by thyself and by thy husband, and by these my bonds and these thy huntsmen, never would I have smitten thy pretty husband but that I saw him there beautiful as a statue, and could not withstand the burning mad desire to give his naked thigh a kiss. And now I pray thee make good havoc of me; pray take and cut off these tusks, pray take and punish them – for why should I possess teeth so passionate? And if they suffice thee not, then take my chaps also – for why durst they kiss?” Then had Cypris compassion and bade the Loves loose his bonds; and he went not to the woods, but from that day forth followed her, and more, went to the fire and burnt away those his tusks away.